Here we have another one of my favorite people, Sandy Livsey! If you’ve been reading along and meeting our tribe, you may have noticed that my clients do become like family to me – to Anne-Marie and I both really. Sandy is one of those people that doesn’t hold back with sharing her feelings and opinions, for better or worse, and is never stingy with how deeply she loves. She is a fighter – for her family, for her friends, for her health and for whatever it is that she is passionate about. When I first met her, I thought she was going to be a student that would test me at every turn…and she was!…but she’s proven to be one of my best teachers. She showed up in my classes ready for peace in her heart and in her body and any time she had a question or came to me with a physical road block, it gave me a chance to find ways to meet her where she was at. Super Mom and Super Grandma! When I ask Sandy how she feels after a class, or a workout, or a new move, I can count on her to be brutally honest which helpful when I need to know how something is working or not working. I know she will be my barometer for most anything. She’s also been such a dedicated student in yoga that she can step in when I need help with new students – showing them the ropes and making them feel welcome. It is obvious to me that somewhere along the way Sandy made the decision to show up – to truly show up for life…for all of it. A favorite memory for me is her coming to our bachelorette party – it made my night to hang out with her! She loves her tequila and loves to celebrate life. And we love that she shares this passion for life with all of us! 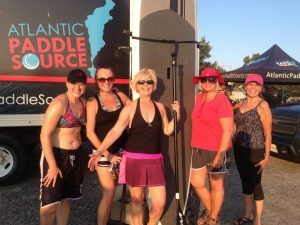 Even though her back was on the fritz, she showed up anyway to cheer us on for this first adventure in yoga and SUP! How did you meet Lisa, and how did you decide she was worth working with? I first met Lisa, as a yoga teacher, in late September 2010. My neighbor had suggested yoga with Lisa and her assistant, Brian Dunning. I took Yoga 101 once a week for a year before deciding that I would never get better at yoga if I did not go twice a week!!! I began going on Sunday mornings and then Lisa invited me to her Yoga For Athletes class. This is a sweaty, challenging, one hour class. I convinced some other people to try the class, and I did use the phrase, “You can do anything for an hour!”. The truth is that Lisa gave me the encouragement to stick with the class and the knowledge to adjust certain things to my body issues. I loved yoga with Lisa as she was obsessed with form and function. She is hands on, makes corrections and always gives options for those of us with “issues”. My issues were being overweight, arthritic knees, and a “bad back”. Lisa has helped me through all of these issues. I never stopped Yoga 101 class; with Lisa, I continued to learn the basics for years!!! When I discovered Lisa was a massage therapist, I had my first massage ever with her! Massage was life changing for me; I would have thought it a frivolous expenditure, but it is a healthy luxury (emphasis on the healthy part!). I decided to try the strength training at Brute with Lisa because of Dolores Little. Dolores nagged me for about 2 or 3 months after she began with Lisa. I was very nervous about getting injured and being too slow. And, yes, I have worked though some injuries (once again, Lisa and I learned about my body’s limitations!) and made adjustments. And I am still too slow, but Dolores and Lisa (and some other super nice ladies) have made me feel welcome and are patient with me and my adjustments! Lisa is great to work with simply because she understands my body with all of its limitations and strengths. What were your goals? Was she helpful at reaching them? My goals with strength training were simply to get strong and not get hurt. I wanted to be able to do yard work, house work, and other necessary repairs/chores at my house (without constantly pulling out my back!). 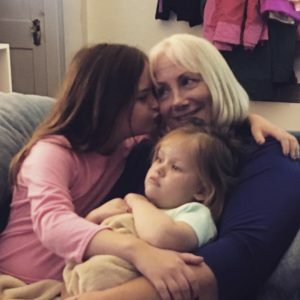 As a widow and a woman in my 50s, I felt the need to get strong and stay that way! 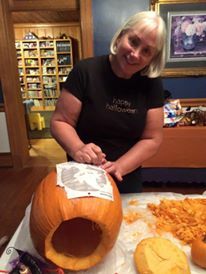 Lisa has helped me continue to improve, even after surgery. I have become stronger, and, knock on wood, my body is doing great right now! Would you recommend Lisa as a trainer, massage therapist, or yoga teacher? What makes her so special? I would, and have, and will continue to sing my praises for Lisa for yoga, massage, and strength training. I feel all of Lisa’s knowledge of the body, combined with her life experience (and she’s still young! ), have made her an excellent teacher. She really listens to you, encourages you to listen to your body, and tells you when it’s ok to push yourself. I have had other coaches (I was a competitive swimmer from age 10 -20), and I have coached swimming. Her knowledge of form and function is priceless. A good coach listens, adjusts, pushes, encourages, and helps you achieve your goals. Good coaches and teachers are a rare treasure; Lisa is a truly a treasure! My favorite thing about working with Lisa at the gym is that the workout is never the same! This is also something that frustrated me at the beginning (and maybe even some now!). In my former years (decades ago) as a swimmer, I lifted weights. We did the same weight workout, 3 days a week, and the only thing that changed was when you went up in weight. I was so accustomed to judging my improvement with the same workout each time. Now, it’s more difficult to judge my progress, but I am working so much harder. Lisa’s workouts are never boring! Thank you, Lisa! You chose great pictures! To recap that last question, Lisa is great for all three: training, yoga, and massage! And not only are her training workouts varied, so are her yoga classes! We love you and your spirit, Sandy! Thank you for trusting us with your fitness and mindfulness practice.